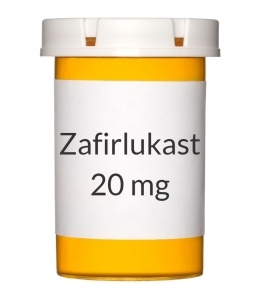 USES: Zafirlukast is used to prevent asthma symptoms and to decrease the number of asthma attacks in people 5 and older. It helps make breathing easier by reducing swelling (inflammation) in the airways. Regular use of this medication can help control your asthma, improve your ability to exercise, and decrease the number of times you need to use your rescue inhaler. This medication works by blocking the activity of natural substances (leukotrienes) that may cause or worsen asthma. This medication does not work immediately and is not used to treat sudden asthma attacks. OTHER USES: This section contains uses of this drug that are not listed in the approved professional labeling for the drug but that may be prescribed by your health care professional. Use this drug for a condition that is listed in this section only if it has been so prescribed by your health care professional. This drug may also be used for hay fever and to prevent breathing problems while exercising. HOW TO USE: Read the Patient Information Leaflet provided by your pharmacist before you start taking zafirlukast and each time you get a refill. If you have any questions regarding the information, consult your doctor or pharmacist. Take this medication by mouth, usually twice a day or as directed by your doctor. Zafirlukast should be taken on an empty stomach at least 1 hour before or 2 hours after meals. Your dosage is based on your age, medical condition and response to therapy. Use this medication regularly in order to get the most benefit from it. To help you remember, use it at the same times each day. Do not increase or decrease your dose or stop using this medication without consulting your doctor. Continue to take other medications for asthma as directed by your doctor. This medication works over time and is not meant to relieve sudden attacks of asthma. Therefore, if an asthma attack occurs, use your quick-relief inhaler as prescribed. It may take 1 to 2 weeks before you feel the full benefit of this medication. Inform your doctor if your condition (e.g., asthma symptoms, number of times you use your rescue inhaler) persists or worsens. SIDE EFFECTS: Headache, sore throat, trouble sleeping, malaise, and nausea may occur. If any of these effects persist or worsen, notify your doctor or pharmacist promptly. Remember that your doctor has prescribed this medication because he or she has judged that the benefit to you is greater than the risk of side effects. Many people using this medication do not have serious side effects. This drug may rarely cause serious (possibly fatal) liver disease. Seek immediate medical attention if you notice any of the following unlikely but very serious side effects: severe stomach/abdominal pain, persistent nausea/vomiting, unusual tiredness, yellowing of the eyes/skin, dark urine. If your doctor determines that you have experienced liver problems from this medication, do not take it again. Tell your doctor immediately if any of these rare but very serious side effects occur: mental/mood changes (e.g., agitation, aggression, hallucinations, abnormal dreams, depression, suicidal thoughts/suicide), worsening shortness of breath, tingling of the hands/feet, muscle/joint aches, coughing up blood, swelling of the hands/feet, chest pain, easy bruising/bleeding, signs of infection (e.g., fever, persistent sore throat). A very serious allergic reaction to this drug is unlikely, but seek immediate medical attention if it occurs. Symptoms of a serious allergic reaction may include: rash, itching/swelling (especially of the face/tongue/throat), severe dizziness, trouble breathing. This is not a complete list of possible side effects. If you notice other effects not listed above, contact your doctor or pharmacist. In the US - Call your doctor for medical advice about side effects. You may report side effects to FDA at 1-800-FDA-1088. In Canada - Call your doctor for medical advice about side effects. You may report side effects to Health Canada at 1-866-234-2345. PRECAUTIONS: Before taking zafirlukast, tell your doctor or pharmacist if you are allergic to it; or to other leukotriene blockers (e.g., montelukast); or if you have any other allergies. This product may contain inactive ingredients, which can cause allergic reactions or other problems. Talk to your pharmacist for more details. Before using this medication, tell your doctor or pharmacist your medical history, especially of: liver problems. Caution is advised when using this drug in the elderly because they may be more sensitive to the side effects of the drug, especially headache, diarrhea and nausea. This medication should be used during pregnancy only if clearly needed. Discuss the risks and benefits with your doctor. This medication passes into breast milk. Breast-feeding while using this medication is not recommended. Consult your doctor before breast-feeding. DRUG INTERACTIONS: Your doctor or pharmacist may already be aware of any possible drug interactions and may be monitoring you for it. Do not start, stop or change the dosage of any medicine before checking with them first. Before using this medication, tell your doctor or pharmacist of all prescription and nonprescription/herbal products you may use, especially of: aspirin, drugs affecting liver enzymes that remove this medication from your body (e.g., macrolide antibiotics including erythromycin), drugs removed from your body by certain liver enzymes (e.g., "blood thinners" such as warfarin; certain calcium channel blockers such as felodipine; cisapride; certain anti-seizure drugs such as carbamazepine and phenytoin; theophylline). Check all prescription and nonprescription medicine labels carefully since many products contain aspirin, which may increase your risk of side effects if taken together with this medication. Low-dose aspirin, as prescribed by your doctor for specific medical reasons such as heart attack or stroke prevention (usually at dosages of 81-325 milligrams per day), should be continued. Consult your doctor or pharmacist for more details. This document does not contain all possible interactions. Therefore, before using this product, tell your doctor or pharmacist of all the products you use. Keep a list of all your medications with you, and share the list with your doctor and pharmacist. NOTES: Do not share this medication with others. Laboratory and/or medical tests (e.g., liver function tests) may be performed from time to time to check for side effects. Consult your doctor for more details. Learn to use a peak flow meter, use it daily, and promptly report worsening asthma (such as readings in the yellow or red range or increased use of quick-relief inhalers). Avoid allergens, irritants, smoking, and other factors that make asthma worse. Most people with asthma should receive a flu shot annually. Discuss with your doctor. STORAGE: Store in the original container at room temperature between 68-77 degrees F (20-25 degrees C) away from light and moisture. Do not store in the bathroom. Keep all medicines away from children and pets. Do not flush medications down the toilet or pour them into a drain unless instructed to do so. Properly discard this product when it is expired or no longer needed. Consult your pharmacist or local waste disposal company for more details about how to safely discard your product.